miDVD Pro - discounted launch price! miDVD Pro is our brand-new DVD creator that builds on the features of miDVD, and it's now live on the Mac App Store! miDVD (the free one) has shot up the Mac App Store charts on its first day. It's now number 4 and rising on the Video free app chart in all major countries. Smart Themes - great looking themes for your DVD menu. The themes automatically adapt to the number of movies you have. Multiple Movies - each miDVD project can hold up to 16 movies. Projects - save your miDVD Project files for later or. Soundtracks - add music of your choice to your DVD menu. miDVD Pro is $19.99 as a special discounted launch price. Do yourself a favour and get it today! Cosmos 2.4.0 - updated and HALF PRICE! Cosmos 2.4.0 is out now on the Mac App Store and shedworx.com - and it's now half the original price! This update moves Cosmos away from syncing with online Cosmos accounts, back to being a video manager. We have decided to re-focus Cosmos back on video management so that we can move the (old) Cosmos iOS application and service in a new direction. In the coming months we will re-launch the Cosmos iPhone and iPad photo-sharing app with a new name to focus on what this app can be used best for. For those people using the desktop version of Cosmos to manage their Cosmos account, stay-tuned. We will have a FREE version of the renamed Cosmos out soon to let you manage your online account easily. Smart Converter and Smart Converter Pro version 1.4.3 are now available on the Mac App Store and shedworx.com. This updates brings in support for the Apple TV 2, the iPad 3 and iPhone 4. The new presets for Apple TV and iPad support video up to 1080p with higher bit rates. We have left the main presets (the ones on the main Smart Converter window) at lower settings because you really can't tell the difference between 720p and 1080p, especially on an iPad. The new high resolution settings can be found under the 'Other' menu. Since the first iPad was released in 2010 the iPad has become the benchmark for tablet computing. With the release of the 3rd generation iPad or iPad 3 or "new iPad" as apple calls it there are some Great Expectations, no matter what you call it, for this device to live up to. The Shedworx team are among the first people in the world lucky enough to see if this new iPad can match those expectations. The first thing that you notice even before unlocking is the new screen resolution. The much touted retina display technology that first graced eyeballs on the iPhone 4 has arrived on the iPad. Can you notice the difference? Short answer is yes. Much like comparing the screens iPhone 3 models with the retina display on iPhone 4 you will be hard pressed to dismiss it as just a gimmick. It really makes using the iPad that much fresher and enjoyable experience. If you use an iPad for an eReader you will want to upgrade. The retina display on the new iPad isn't quite as dense as the iPhone 4 - 264 PPI vs 326 PPI. You don't have to look quite as hard to make out the pixels but given you hold your iPad further away than an iPhone it's not noticeable. Above: Illustrating 264PPI vs 326PPI. The retina display is the main difference you will notice between your old iPad and the new model. Cosmetically the iPad 3 looks and feels just like the iPad 2. The iPad 3 is slightly heavier than the iPad 2 and just a little bit thicker. The iPad 3 has the new Apple A5x dual core 1GHz processor. The added "x" signifying the addition of a quad core GPU. The iPad 3 now is 4G compatible as well. No 4G support for the iPad 3 in Australia yet. We hear it's pretty fast. Out of the box it comes with iOS 5.1 installed. Using the iPad 3 feels just the same as the iPad 2; it's not any faster but importantly it's not any slower. You notice the performance difference when you compare it to the first iPad the most. Logging in to Gmail took 46 seconds on the original versus 33 seconds on the iPad 2 and the iPad 3. To test out the new Quad Core GPU we tried out the latest Infinity Blade II game. This version has updated graphics to support the retina display on the new iPad. On both devices the game loads up at the same speed. The iPad 3 version runs just as well as it does on the iPad 2 but with more antialiasing and higher resolution graphics. You can also put that new A5x processor to the test with video playback. The iPad 3 now supports playback of 1080p video. Smart Converter will be updated soon to support 1080p conversions for the iPad and the new Apple TV. If you were disappointed with the 0.7Mp rear camera in the iPad 2 the new 5Mp camera should fix that. The same awkwardness of taking a photo with such a large device is still there but now you're rewarded with photos that you can potentially print out in a size larger than the iPad. The pictures are much sharper and colours are brighter overall compared to the iPad2. This better quality image is seen also in the new 1080p video recording capability. The new iPad is a great device. If you have never owned a tablet device then the new iPad is the place to start. If you have an iPad 2 and are expecting huge leap in performance or to be blown away by new and exciting features your expectations aren't going to be met. You would only get that from upgrading from the original version. Just like in 2010 the iPad is still the benchmark for tablet devices in 2012. We've had a huge amount of interest in PS Vita support for Smart Converter Pro. Any excuse to muck around with a new gaming console rather than do real work goes down well at Shedworx, so we thought we'd do the right thing and give it a go. Our first challenge was to get our entire video test set converting, transferring and playing back on the PS Vita. While this work ate into valuable gaming time, we thought we should get this out of the way. After a couple of days of testing and tweaking settings, making a few changes here and there, we were good to go. The PS Vita will play video files up to 960x540 in size, using the h.264 codec and MP4 container. You won't see any Smart Converter ''Fast" conversions when converting for the PS Vita because of its obscure resolution. This means that every file you convert has to be converted in full. Click here to learn more about Smart conversions. Luckily, Smart Converter is now multi-core enabled, so these conversions will fly along, especially on new quad core Macs. On my new MacBook Pro I converted a 25 minute video to PS Vita format in 3 minutes. Too easy! You have to run the Content Manager Assistant on your Mac in order to transfer any files. The Vita won't mount as a drive, so you have to run this app. Fortunately there is a Mac installer for this, so download it from Sony here. The Content Manager Assistant requires you to nominate where your photos, videos and music files will come from. I set up a PS Vita folder under Photos, Movies and Music to use for my transfers. I then set up Smart Converter Pro to put all converted movies into the Movies/PS Vita folder, ready for transfer. Once my batch conversion was done, I plugged in the Vita via the (supplied) USB cable. You then have to start Content Manager on the Vita, go to Video and you will see the movies on your Mac. Tap Select All and they will all copy over. The PS Vita has a 960x544 OLED screen which is quite a bit bigger than the iPhone but also quite a bit clearer. Movies down sampled from Full HD 1080p look as sharp as ever and even with the bigger screen size makes for a far better viewing experience than to the iPhone. I've comfortably watched a full length movie on the Vita whereas I can't put up with the iPhone sized screen for that long. We're not huge gamers here at Shedworx but we had to give a few titles a go. Golden Abyss: Uncharted is by far the favorite and really shows you what the PS Vita is all about. We've all heard how the iPhone and iPod Touch are killing the small handheld consoles like the Nintendo DS and previous Playstation PSP. Play one game on the PS Vita and every iPhone game looks very lame. So what's the big deal? The screen is lower resolution, graphics are technically no better. It comes down to the high-end games like Uncharted. Here's what makes the PS Vita a killer gaming platform. The PS Vita has a 5" screen over the iPhone 3.5" screen. This means that the PS Vita screen has almost twice the surface area of the iPhone - a huge difference when it comes to games. The bigger unit also fits far better in the hand compared to the iPhone. After using the Vita, the iPhone feels pokey and cramped. The PS Vita has an OLED screen which basically just performs better than the TFT screens on iPhones and iPads. OLED screens offer better contrast, better viewing in full sunlight and faster response times than TFT screens. These characteristics mean that the PS Vita OLED screen just looks better than the iPhone screen, even though it's lower resolution. You can't play these complex games on an iPhone because you lose half the screen to your thumbs. The two joystick controllers let you control the main part of the game with the right stick while using the left to change viewpoint. As a novice gamer, I found the PS Vita controllers far easier to use than the touch screen on an iPad or iPhone. Old school Playstation gamers will recognize the traditional Playstation button set on the right of the Vita. These buttons are used for the usual Jump and Shoot actions. Sure, the iPhone has a gyro too, but the Vita games that we've seen so far make great use of the gyro. 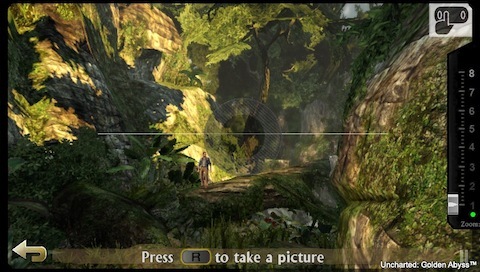 The Camera in Uncharted uses the gyro to make you hold the camera level, front touch screen to zoom in/out and one of the buttons to take the photo. It sounds a bit complex but it becomes quite instinctive to use after a couple of goes. Again, the iPhone has this too, but this makes a big difference to how the PS Vita works compared to the older PSP. The whole device can be driven by touch now, so that you only switch to the buttons and joysticks when in game mode. This makes for a far better device than the PSP. We didn't even notice this one until Uncharted got going. Using a back touch screen opens up a whole new world of games and puzzles that I'm sure will be embedded in more and more games. I think that Sony may finally have a hit on its hands with the PS Vita. We test just about every possible tech gadget that comes along here at Shedworx and we all think that the PS Vita is awesome. The PS Vita really is a full blown Playstation in your pocket. Fantastic game play with solid video, photo and music capabilities make it a real winner. 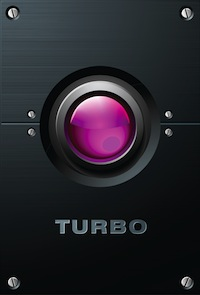 We've hit the Turbo button on Smart Converter and Smart Converter Pro! The 'smarts' behind Smart Converter mean that we often don't need to convert a video when going from one format to another. This gives you lightning fast conversions. For times when we can't do a 'smart' conversion, we have to do things the regular way, which can take a while. Up until now Smart Converter only used one core of your CPU in regular mode. Now Smart Converter and Smart Converter Pro use all cores of your CPU. With all new Macs now shipping with Quad Core CPUs, multi-core processing means that Smart Converter will go at least 4 times as fast for regular conversions. This update also includes a few bug fixes and a re-vamp of the way we handle Flash Video conversions. Any problems you might have had with flv video will now be fixed.